I want you to feel better fast. I want to feed every cell of your body and let those cells begin to fix you. From the inside out! If that interests you, then read on…. Your world is about to change! What Do You Want And How Do We Get There? Do you want to sleep better, look better, and have a brighter mood and energy? Would you like fast, efficient weight loss with improved triglycerides and blood glucose? And no hunger? The fastest way to permanent change is by changing your daily body chemistry. So! If we change what you eat and drink every day, your body chemistry can change quickly. 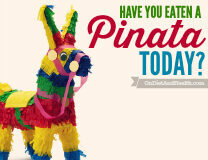 You’re going to eat anyway, so why not do it differently and see what happens? 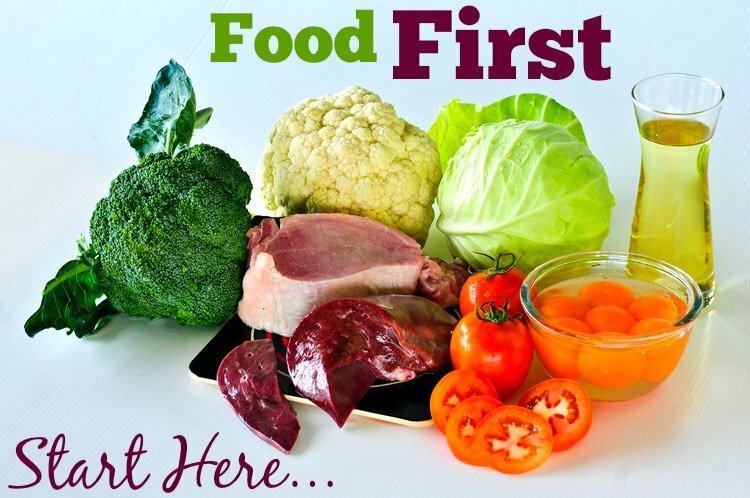 Food First is the subtitle of my podcast “Primal Diet – Modern Health”. It’s what I tell the clients in my San Antonio clinic, the Diet and Health Center. And it’s the #1 rule I live by. If it can walk, fly, swim or crawl under its own power, it’s a protein. Humans hunted birds, beasts, insects and fish. We ate the meat, the fat and the organs. We cherished the bone marrow and added it to stews. No fat went to waste. Organs tend to be fatty meats. Muscle tends to be lean. Organ meats like liver were more highly prized than muscle (the steak we eat now). 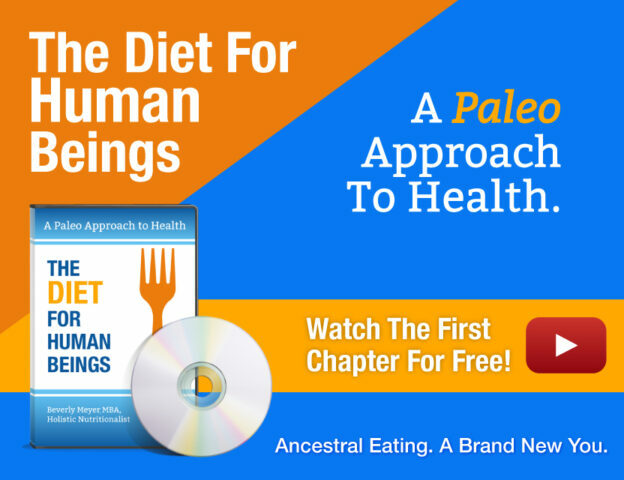 We rendered all the fat from the animal, and learned that fat kept us full and gave us plenty of cellular fuel. Nuts, avocados, coconuts and other fatty foods were good too. We gathered whatever fresh organic plant foods grew in our vicinity at our time of year. “Weeds” (vegetables), flowers, mushrooms, tubers, seasonal fruit and occasional wild rice or other plant seeds provided the small amounts of carbohydrates we might need. Fats and proteins were the biggest part of our calories. Well yes, but where’s the bread, pasta, and chips? Hmmm. That’s a tough one. Why? Because humans are not grazers. We don’t bend over and graze on the seed tips of grass and that’s what wheat, rice and corn are. The seeds of grasses. We might gather and eat small quantities of these, but we would sprout or ferment them first. They weren’t ground into flour and processed into other foods. If you see an avocado, it’s pretty easy to assume it’s food. Same with a blueberry. But fields of waving grain? Or purple cereal circles or sodas? Does that really look like food to your human eyes? Birds and animals eat the grass and grass seeds, and convert those starches into protein and fat for us. Then we eat the animals. Fatty fish and animals provide fat in cold climates. Coconuts provide fat in warm climates. Roots and tubers were the most common starchy food, but they weren’t what we most craved. They’d do in a pinch if the hunt was poor, or our stores of fats and nuts were running low. Wild, organic fruits and vegetables provides us with minerals, antioxidants and vitamins to supplement what we got from the animals and coconuts. Organ meats are exceptionally high in vitamins. (Liver is still our best source of Vitamin A). Humans didn’t catch too many wooly mammoths or wild horses and milk them. 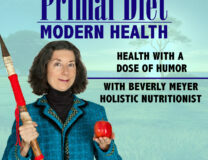 We began using dairy after domesticating animals about 10,000 years ago. Some of us can tolerate butter and cream pretty well, even though they are “new” foods to us. Why? Because they are high in fat and humans require plenty of fat to feel and function well. Many of us do NOT tolerate other dairy, such as yogurt, milk, cheese and kefir. I tolerate clarified butter (ghee) but have zero tolerance for ANY other dairy whatsoever. In my case, it is a “gluten cross-reactive food”, meaning it has proteins similar enough to gluten to make my immune system attack it. Get off all gluten, grains and sugars first. Add tons of veggies and lots of coconut oil, ghee and avocado. (Don’t forget the animal protein). When you’re ready, stop dairy except for ghee, and later try going egg-free. You’re your own best experiment. See what makes you feel and function the best…. 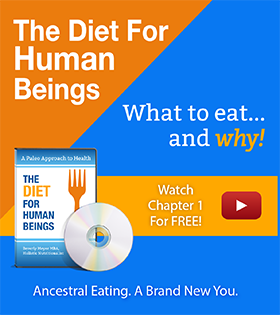 Consider buying a hard copy or a digital download of my professionally filmed DVD, The Diet For Human Beings. I’ll walk you through the diet, right from my home! It’s great to watch one or two sections at a time to really think about what I say. Then watch with friends or family and let me do the talking about a new diet and the changes they’ll see in their health!